WASHINGTON—In a capital characterized by bitterness, hate, disdain, and partisanship, Congress—both parties—and anti-worker President Donald Trump actually found something to agree upon: Fire Fighters (IAFF) are at higher cancer risk, and it’s time to record how big it is. That led lawmakers to pass, and Trump to sign earlier this month, legislation pushed by the IAFF and the Government Employees (AFGE) to establish a national cancer registry for firefighters. “They know what we know, that cancer is a scourge of our industry and the leading cause of line-of-duty deaths. The cancer registry will give us the data we need to fight cancer head on and save fire fighter lives,” said Fire Fighters President Harold Schaitberger during an earlier ceremony in New Jersey, called to help push the bill through Congress. “With President Trump’s signature, the Centers for Disease Control (CDC) is now directed to undertake the collection of detailed data on the occurrence of cancer in fire fighters,” IAFF said in a statement. The law tells CDC to spend some $2 million to create the registry and to work with state officials and fire fighter organizations to both get it up and running and to collect the data. The two unions have been pushing for the voluntary registry for at least two years, following a 2016 report by the National Institute of Occupational Safety and Health (NIOSH) showing higher levels of lung cancer and leukemia, among fire fighters, compared to the general population. NIOSH covered the medical records of 19,309 male fire fighters, active in 1950-2009, in Chicago, San Francisco and Philadelphia. It was the most recent, and most comprehensive, long-range study of fire fighters and cancer. The average fire fighter joined his department at age 28 and served 21 years. Some 78 percent of the fire fighters in the three cities were white men. And 79 percent were still alive at the end of 2009. More than half of the fire fighters in the study were from Chicago. But of those who died, the death rates were higher from lung cancer and leukemia, the data showed. NIOSH’s scholars were unsurprised by the higher risk, which they characterized as “modestly increasing,” compared to the general population. That’s because fire fighters have higher exposures to cancer-causing substances, such as asbestos and arsenic, when battling blazes. “These findings add to evidence of a causal association between firefighting and cancer,” they wrote. “This legislative victory was only possible with the dedication and hard work of IAFF members and a bipartisan cadre of elected federal officials,” two from each party, said Schaitberger. “The strength of the vote in each chamber demonstrates the importance of this legislation and the need to better understand cancer within the fire service.” The new law passed virtually unanimously. 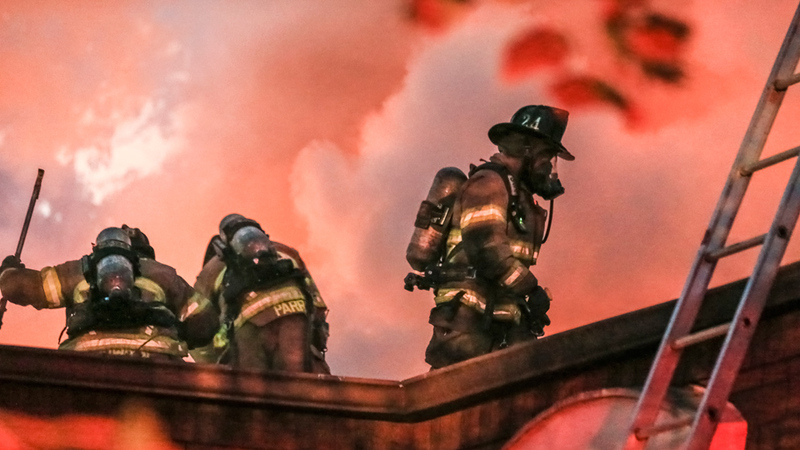 “We have had several non-smoking firefighters who retired and later contracted different types of cancer and diseases that can be related to exposures on the job. Now that Congress ordered the government to start collecting this data, they may be able to prove it,” Bill McGuire, vice chair of AFGE’s Firefighters Steering Committee said in a statement.